What's for dinner? Snow or king? Whoa, that's one big crab! 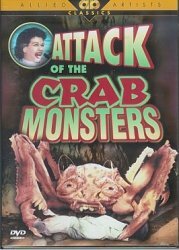 Roger Corman's classic, and one of our most popular titles! Out of print! A mysterious bit of Pacific coral reef and volcanic rock are visited by the Second Scientific Expedition. Rumors have it the first expedition has disappeared. Rumors beyond laws of nature. What does that mean? We don't know but it sounds good. Starring Richard Garland, Pamela Duncan, Russell Johnson, Leslie Bradley, and Mel Welles. You won't want to miss this '50s sci-fi classic from camp legend Roger Corman.